Christmas Begins With the Marionettes and the bpTT Renegades! The beauty and bustle of the holiday season seems to start earlier and earlier each year, but some traditions remain true: Christmas begins with the Marionettes! As always, audiences can look forward to the Chorale, under the expert direction of conductor Gretta Taylor, weaving the Yuletide theme through a mix of classical, spiritual, gospel, popular Christmas favourites, and local calypso and parang. 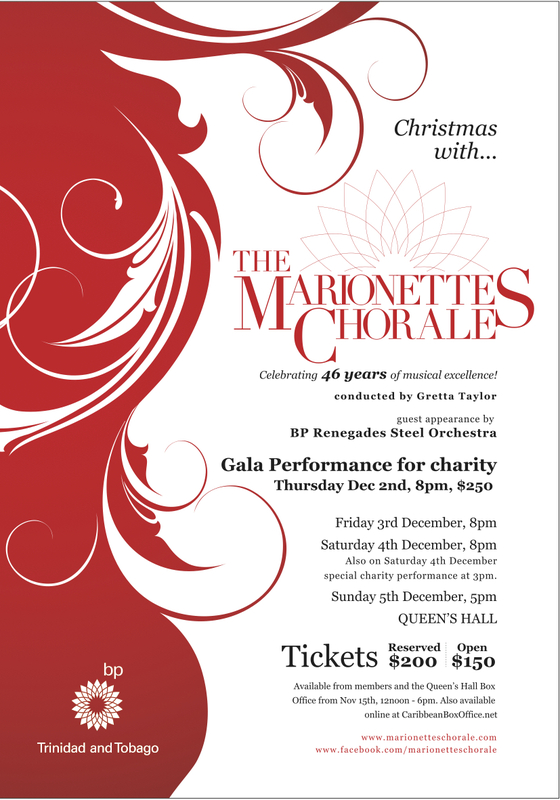 This year the choir also reunites with old friends the bpTT Renegades. It’s a special anniversary year for the entire cast, as the Marionettes Youth Chorale celebrates its 15th anniversary, and the Renegades celebrate 40 years of partnership with bpTT, who have also sponsored the Marionettes and Youth Chorale for 38 years. The Christmas with the Marionettes concert series opens on Thursday 2nd December with a fundraising charity gala. The rest of the concert series runs Friday 3rd December through Sunday 5th December. In collaboration with sponsors bpTT, the group will also present its traditional special matinee on 4th December, a free performance for senior citizens and children from various institutions across the island. Tickets are $250 for the charity gala, and $200 (reserved) and $150 (open plan) for the rest of the run. Tickets go on sale on 15th November, and are available at the Queen’s Hall Box Office (tel: 624-1284), from members of the Chorale, and online at CaribbeanBoxOffice.net. The Chorale’s two holiday CDs ­– A Christmas Album (which features earlier collaborations with the Renegades) and Sing Noel – will also be on sale during the concert, and the full albums and individual tracks are available online at iTunes, CDBaby.com and TrinidadTunes.com.